Paraglider Horacio Llorens sails through the air as the dazzling northern lights shimmer during a Jan. 12, 2016, photo and video shoot in Tromsø, Norway. 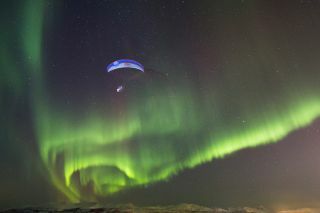 Braving subfreezing temperatures, snowstorms and the possibility of getting soaked in Arctic seas, a paraglider finally got his wish: a photo with the aurora borealis. Horacio Llorens is one of the world's top acro paragliders. He has always wanted to fly during an aurora display, but hadn't managed to time his flight correctly. This month he finally managed it, and you can watch Llorens soar with the aurora in this amazing video released by Red Bull. It was a difficult photo shoot because the aurora borealis, or northern lights, is most visible in winter. (It is hard to see during the summer at high latitudes because the nights are so short.) And that means cold weather, especially in Norway. The photos were taken near Tromsø, a city of 50,000 that is the northernmost of its size in the world. Temperatures were about 5 degrees Fahrenheit (minus 15 degrees Celsius) and the weather was damp. On top of that, Llorens had to fly over 28-degree water (2 degrees C). He wore a wet suit to help protect against the possibility of hypothermia. In this stunning long-exposure view, paraglider Horacio Llorens creates light streaks with green auroras in the background during a flight in Tromsø, Norway, on Jan. 13, 2016. Snow storms and poor visibility didn't make it easy. To capture these images, Llorens waited on standby for hours in minus-15-degree-C weather, ready for takeoff in very cold, windy and damp conditions. And because he flew above the water, he also wore a wet suit under his flying outfit, in case he had to land on the 2-degree-C water. "I've found out that flying at night is difficult, especially this far north and during the winter," he said in a statement released by Red Bull. "Tromsø was different from everything I'm used to. It was cold and dark, the wind was strong, and I was surrounded by water. So every decision was important." Paraglider Horacio Llorens stands beneath the shimmering northern lights after a flight in Tromsø, Norway, on Jan. 6, 2016. To get his images, Llorens had to use the latest video technology, which allowed him to capture the lights themselves. Auroral displays are visible to the eye, but difficult for cameras to pick up; usually, videos of them are time-lapse images. Using newer cameras, Llorens was able to make his videos in real time.